Vandyke stitch was part of this stitch challenge last year. The stitch post is here. The working of this beaded version is on SharonB’s blog. I tried to do two things –practice colour study for my sumptuous surfaces class and explore this stitch on this sampler. I preferred short stitches when working on Vandyke stitch sampler. Thus started the first sample with that. The stitches are not visible at all with this big bead. In the second sample the stitches are wider. The narrow and wider versions are alternated in the first sample. The stitches are of same width, but move up and down in the second sample. I tried shortening the length of the finishing stitch in the first sample. It clearly needs more practice! 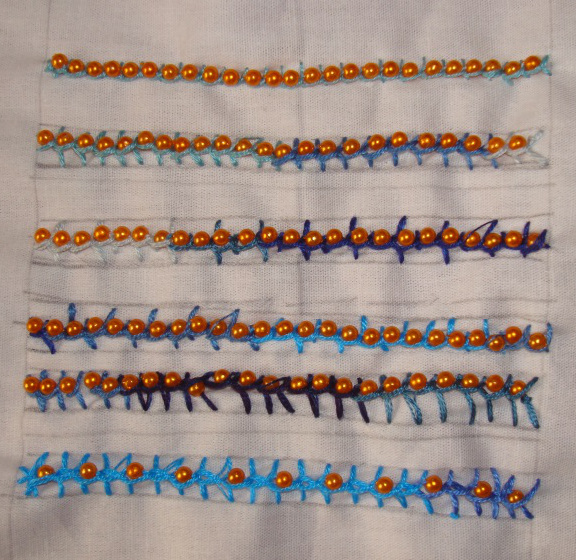 The alternated Vandyke stitches are beaded in the last sample. Sharon’s samples look lovely. I need to practice on this stitch more. But at a later time.